Vesicles in basalt, image courtesy of Ron Schott of the Geology Home Companion Blog. A small cavity in a volcanic rock that was formed by the expansion of a bubble of gas that was trapped inside the lava. Vesicles are commonly found in volcanic rocks– that is, in rocks that solidified from lava. As you might remember from M is for Magma, lava is what you call molten rock when it is extruded onto Earth’s surface. Molten rock– magma and lava– often contains dissolved gases such as water and carbon dioxide. When lava erupts, these gases expand and often are able to escape to the atmosphere as the lava cools and solidifies to form a volcanic rock. Sometimes, particularly in very small, interior vesicles, the gases do not escape and geologists are able to study these gas (or sometimes fluid) inclusions to learn more about the gases and fluids that were in the lava when it erupted. When there are many vesicles in a volcanic rock, this indicates that the lava from which the rock formed was very rich in gases. Since vesicles are open cavities, they sometimes become filled in with secondary alteration minerals such as calcite, quartz, or zeolite. When vesicles are filled with a secondary alteration mineral, they are called amygdules (or amygdales, if you’re British). Since calcite, quartz, and other secondary minerals are generally light in color compared to the brown or black volcanic rock, amygdules can make a volcanic rock look spotted– like a reverse Dalmatian rock. 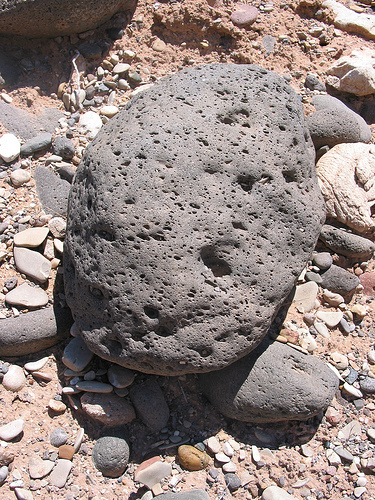 Spotted rock (brown basalt with white amygdules), collected from the Ninetyeast Ridge, Indian Ocean, Summer 2007. 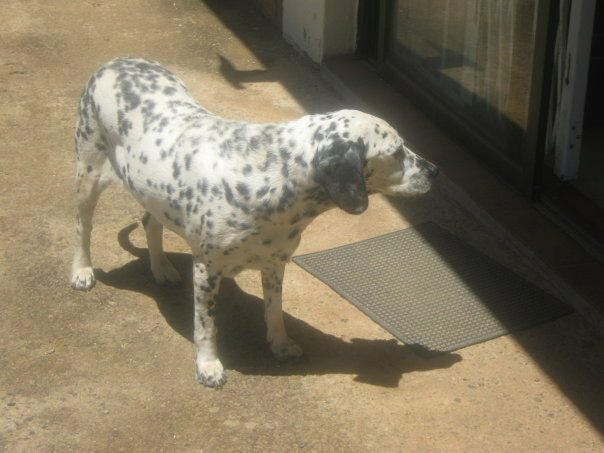 Spotted dog, Johannesburg, South Africa, December 2009. When you describe a volcanic rock, you can say that it is “vesciular” if it contains vesicles and that is it “amygdaloidal” if it contains amygdules. The word vesicle generally applies only to cavities formed in volcanic rocks by gases expanding in lava. The word “vug”– another v word– is another term used to describe cavities in rocks. Vugs can be formed in a variety of ways– such as through faulting, folding, or collapse of a rock– and are often partially filled with secondary minerals. Since I’m currently traveling and don’t have all my geo-pictures at hand, I’ve asked some of my geologist friends and geobloggers to send me some pictures of vesicles, amygdules, and vugs. Ron Schott already kindly gave me the vesicle picture at the top of this post. I am going out now for a few hours, but this evening I’ll hopefully be able to add some more pictures to this post. Feel free to send your own vesicle, amygdule, and vug pictures to georneysblog (at) gmail (dot) com, and I’ll post them here. Please include what– if anything– you’d like me to use as credit for the picture. Thanks! What do you call a rock that has both vesicles and amygdules? Is that even possible? Spurge- definitely a rock can have both. You can just say "amygdaloidal" (implies there are vesicles) or you can use both descriptors.